The Morris Canal Rockaway River Aqueduct is located in Denville Township and is part of the Morris Canal Historic District, which is listed on the New Jersey and National Registers of Historic Places. Abandoned in 1924 when the canal was closed, the remaining masonry components of this historic engineering accomplishment are now threatened with demolition by Denville Township in an attempt to alleviate flooding along the Rockaway River. While the ownership of the aqueduct site is in question- the state, a municipality, or the owner of the adjacent restaurant – the extant masonry piers and abutments are clearly a contributing resource to the Morris Canal Historic District and deserve to be protected. The Morris Canal opened in 1831 and was an international engineering marvel of its time. In its 102-mile-length the canal overcame more elevation change than any other navigation canal ever built. In addition to a series of locks and inclined planes, the Morris Canal relied on a number of other structures – aqueducts, culverts, waste gates, stop gates, spillways, – to enable it to function as a navigable waterway. The Morris Canal Rockaway River Aqueduct was one of eight documented aqueducts along the entire route of the canal and allowed the canal to traverse the Rockaway River within what is now Denville Township. As constructed, the aqueduct was a large wooden trough supported on stone masonry abutments and piers as it crossed the river. The water-filled trough was large enough to allow the 90-foot-long, 10.5-feet-wide canal boats carrying 70 tons of cargo to pass over it and continue either easterly or westerly along the canal channel. Following the closing of the Morris Canal in 1924, the waterway was drained, locks were filled in, inclined planes demolished, bridges removed and the timber trunk, or trough, of the Rockaway River Aqueduct, was demolished. However, the stone masonry components of this aqueduct were left in place to be re-used in a regional sewer line project. 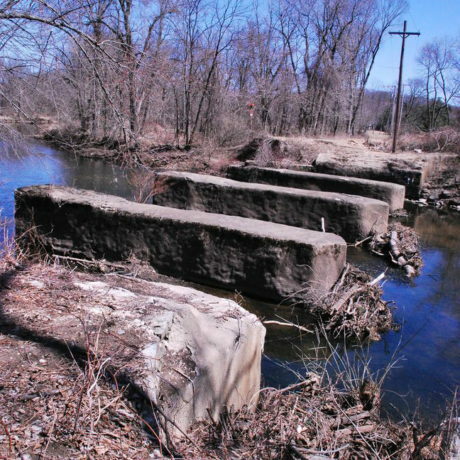 Since it was standard practice at the time of the Morris Canal’s dismantling to demolish the supporting piers and abutments of aqueducts in other locations along the canal, their existence makes the Morris Canal Rockaway River Aqueduct site the most intact surviving aqueduct site along the entire 102-mile route of the overall canal. Today the Rockaway River Aqueduct site is adjacent to an operating restaurant and wooded wetlands. Although coated in cement, the aqueduct’s masonry components are intact. They are accessible to be viewed by the public, including patrons of the nearby restaurant, which is housed in a rehabilitated canal store. For a number of years various groups, municipalities and counties have been striving to preserve sections of the Morris Canal as a Morris Canal Greenway. This Greenway seeks to preserve the historic elements of the canal while at the same time providing historic interpretation, recreational opportunities and environmental protection as preserved open space. As a result, this locale and the aqueduct site offer tremendous opportunities for becoming an outstanding part of the growing Morris Canal Greenway for the public’s enjoyment. In fact, Denville Township has acquired for public open space a significant length of well-preserved Morris Canal on the opposite side of Diamond Spring Road from the aqueduct site. However, because Denville Township suffers from frequent flooding of the Rockaway River, the township has been considering options for reducing flooding and has recently been focusing on the historic aqueduct’s piers and abutments, claiming that they collect floating debris in the river which hinders flow and contributes to flooding. To date, no hydrological study has been conducted that confirms this assertion. However, the township has announced their plans to proceed with demolishing the historic aqueduct structures and has appropriated $50,000 to carry out the work. Preservation New Jersey acknowledges that flooding is a serious concern, but believes there are options for addressing it that do not require the loss of heritage. Similar structures, such as the Mule Bridge Pier in Boonton, have been saved and restored, and serve today as community landmarks. PNJ urges Denville Township to consider abandoning its plans to demolish the Morris Canal Rockaway River Aqueduct and instead focus on thoroughly exploring other options for flood abatement. The Morris Canal Historic District is an extremely important historic resource to New Jersey and the nation, and its significance to Denville should be highlighted as the township celebrates its Centennial this year.